The halls are decked and our house is ready for Christmas. Join me for a tour! 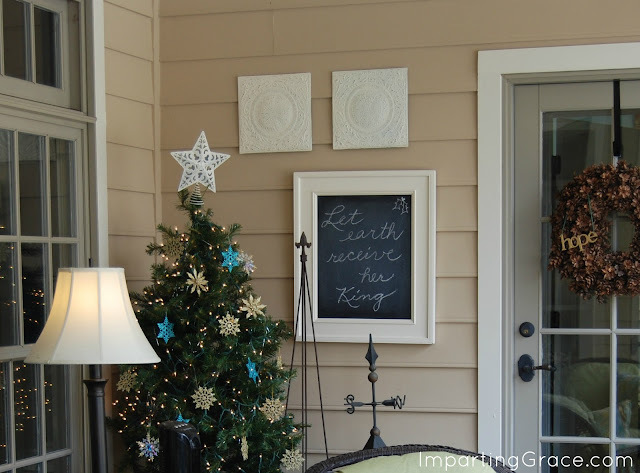 Since the porch is an outdoor living room, I like having a Christmas tree in the corner! Inside, our decorations are simple this year. Our son Preston had surgery on December 14, and I had just didn't have time or energy to get out every decoration. But I think things still look festive, so I'm really glad for you to come in. 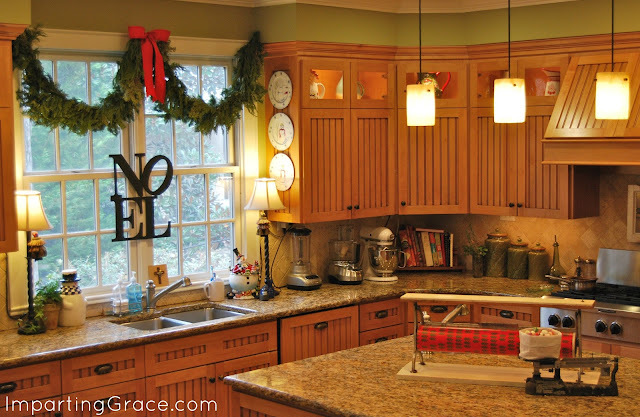 Yes, that's a Lego Advent calendar on the counter. Of course. Always fun to tour your magnificent home. I love his cozy study. Great ottoman. I love visiting your home - just so lovely! 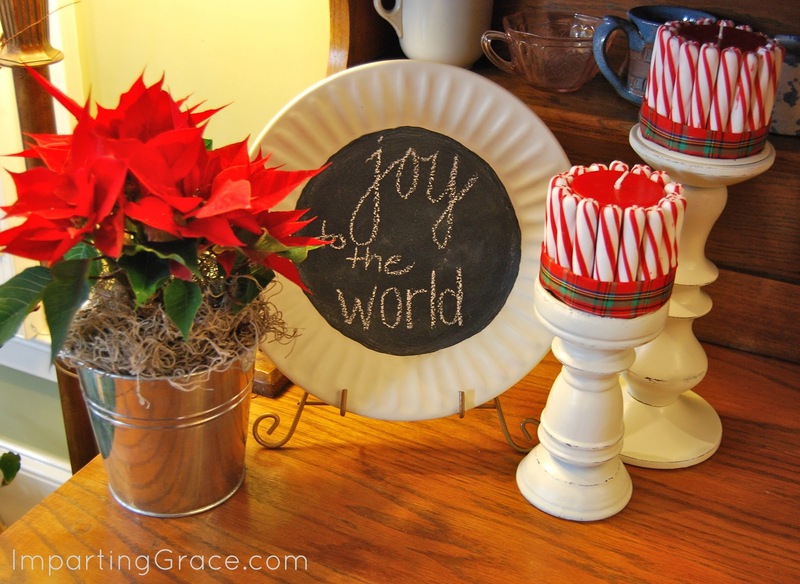 My favorite thing you have done this year is running the ribbon strips down your table in your porch - great and simple idea! Wishing you a happy and peaceful holiday! Your house is beautiful!!!! The decorations are perfect!! You've done such a beautiful job! My dream home right there!! You did a great job decorating! What a lovely house tour I love the wreat on the front door. Your kitchen is beautiful too. Just gorgeous! 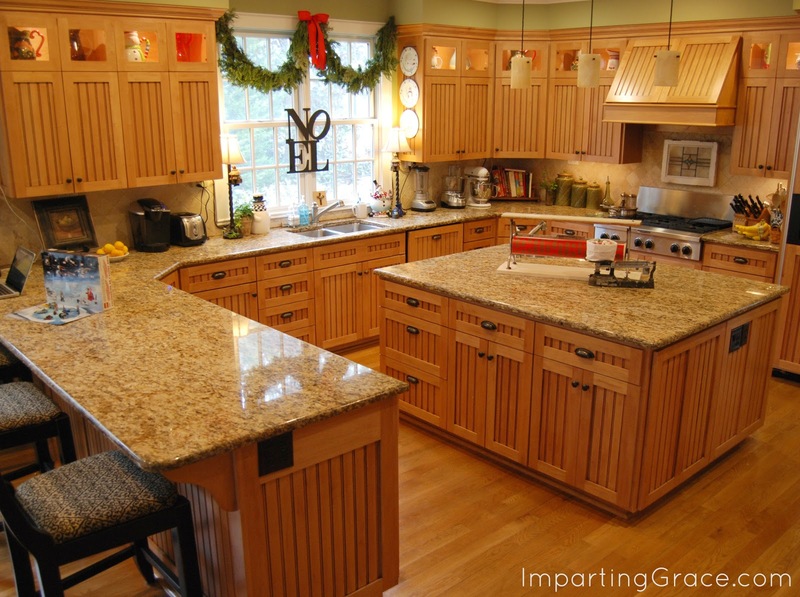 I love your home, especially that huge island in the kitchen - what a great work space! Thank you for the splendid tour. 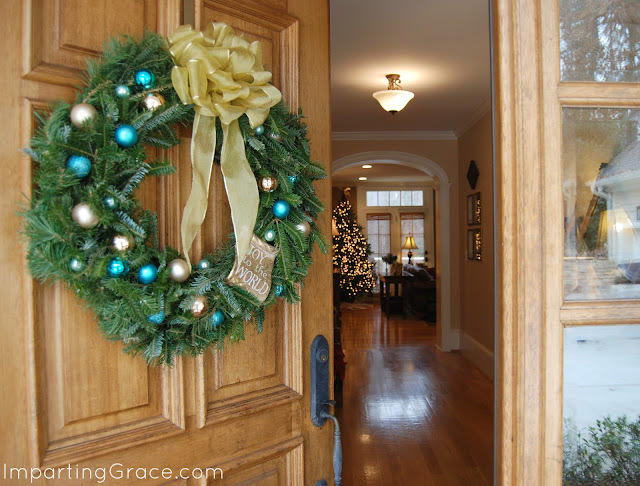 Your home is lovely-you are blessed and your blog name fits you so well. You are a gracious lady. I hope your son is recovering from his surgery. I will pray for him. Merry Christmas! it all looks awesome, but that screened porch is so cozy! it's my favorite! Your home is absolutely beautiful, Richella! 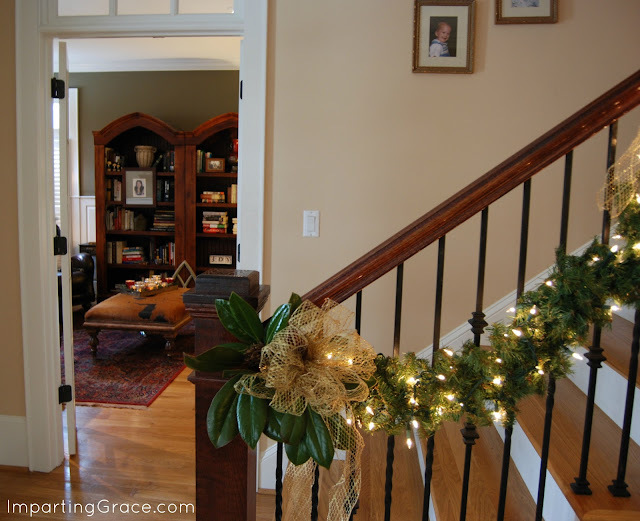 You may have simplified your decorating, but you certainly did not diminish the holiday loveliness. Best wishes to your son for a speedy recovery! So, so pretty, Richella! Hope you're feeling better! Richella, you have a beautiful home. Thank you for the tour. I wish your son a speedy recovery. Blessings to all. It feels like home! 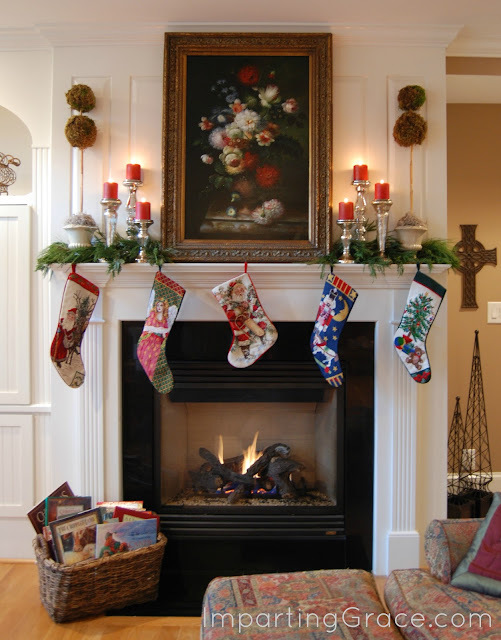 It is so cozy and decorated so beautifully. Thanks for sharing! Just beautiful, Richella! I love that you can see your tree through the opened front door. What a welcoming sight! 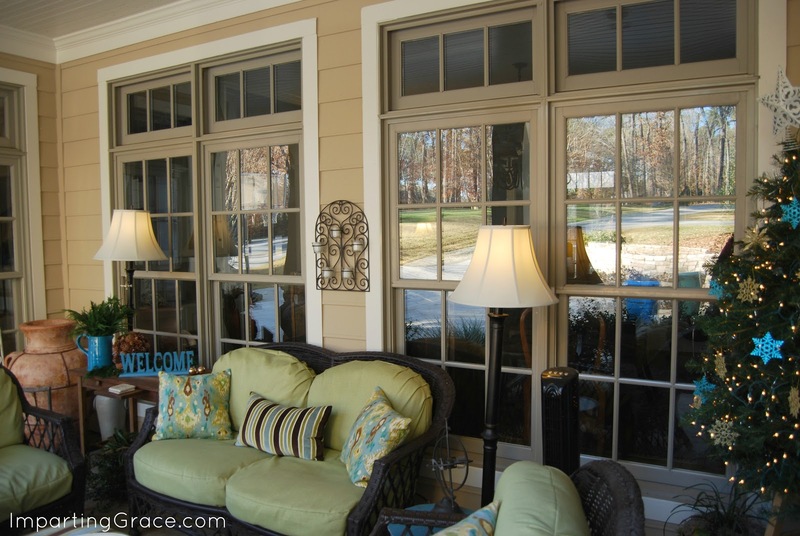 Your front and back porches are just stunning! What beautiful views too! I'd be spending all my time in those to rooms. What a beautiful home Richella! HAve a very blessed Christmas with your family! 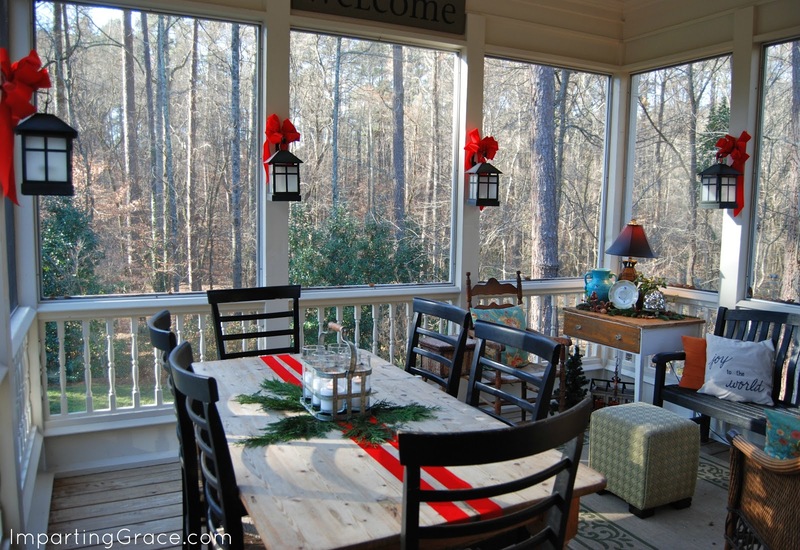 Your entire home is just lovely, but it is your screened porch that I especially love! P.S. Hope your son is doing well! so many gorgeous decorations! 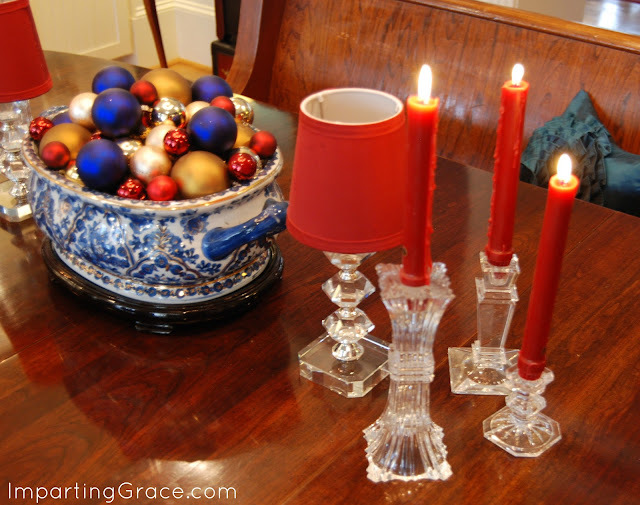 i love the candy cane candles, the lanterns and the colors in your dining room! so fun! 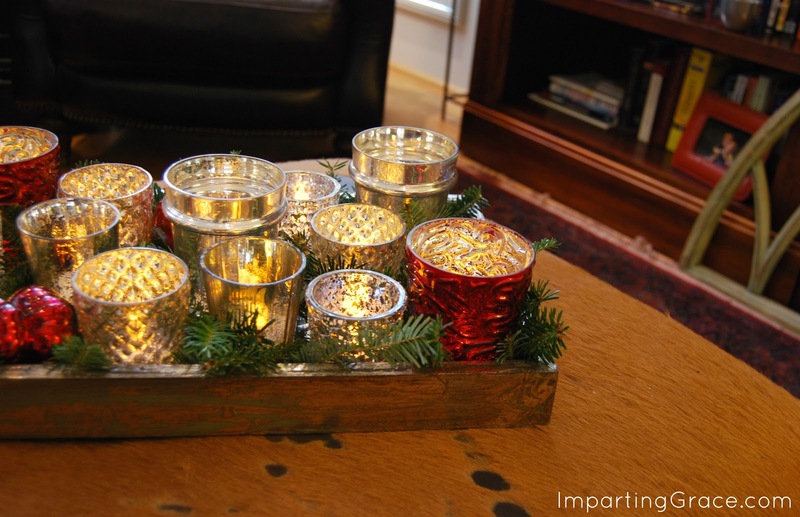 I LOVE the tray of beautiful candles on the new ottoman. 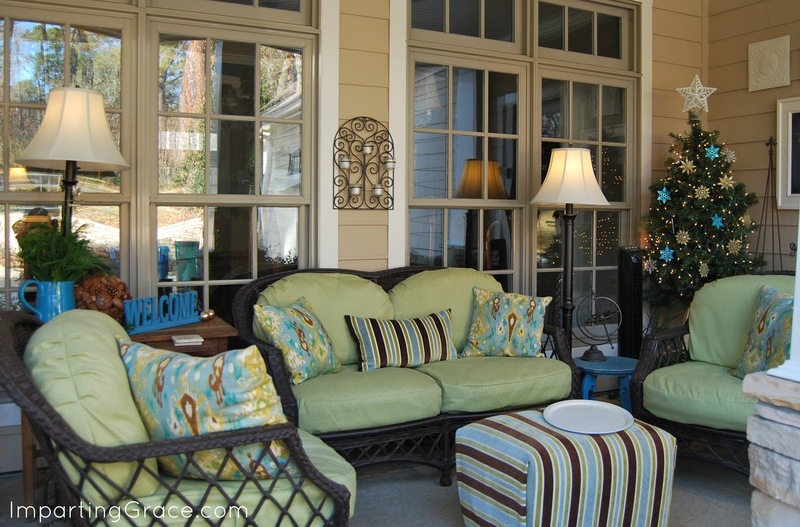 Your porch is so inviting (as usual!) and festive. 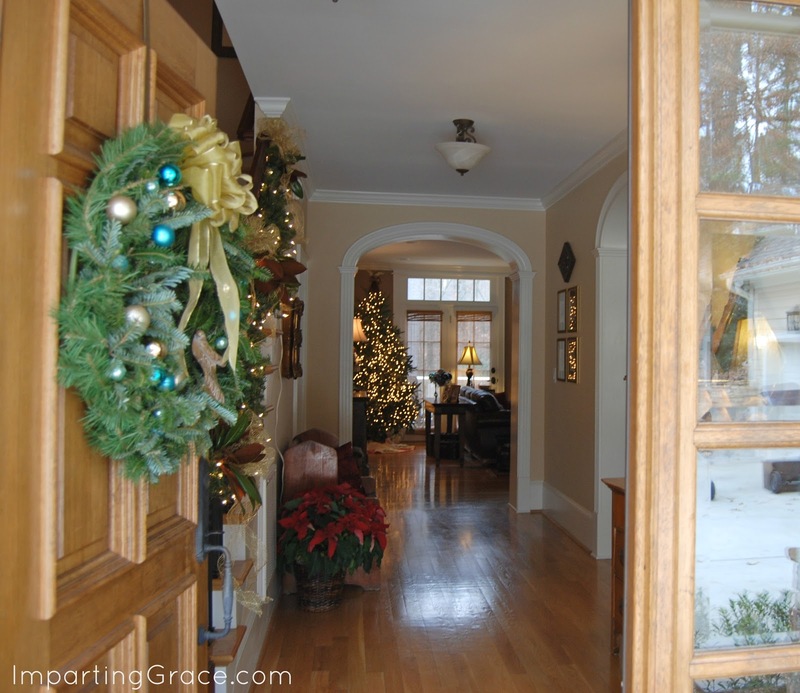 Hi, I really love your house and decorations. I was wondering are those little lamps or did you make them? Your home looks gorgeous all decked out for Christmas. I love that you have a little tree in your outdoor living room. I am visiting from The Nester's party. Merry Christmas! Lovely home, Richella. I especially like the color of your living room walls. Would you mind sharing what color that is? I'm searching for a similar color for my bedroom. Hope you and your family have a wonderful Christmas. Your home is beautiful dressed for the holidays! 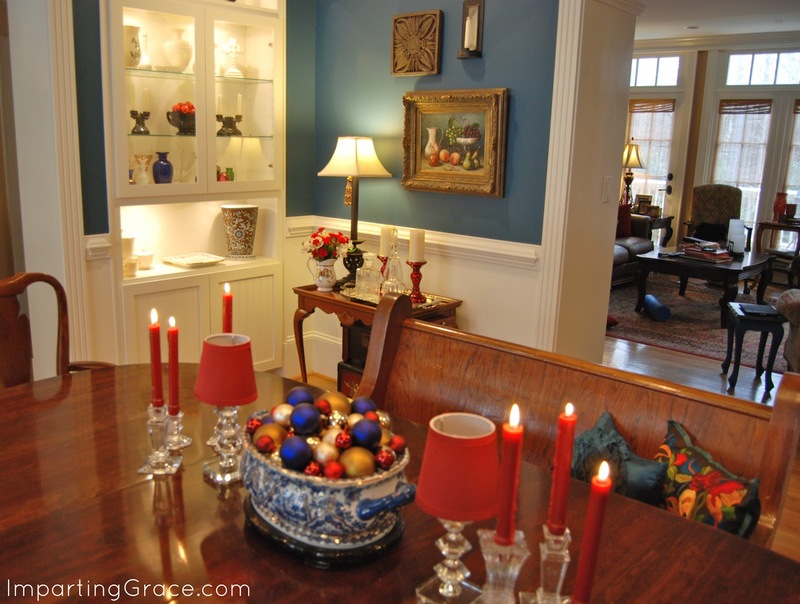 I, too, love that (Duke) blue dining room. 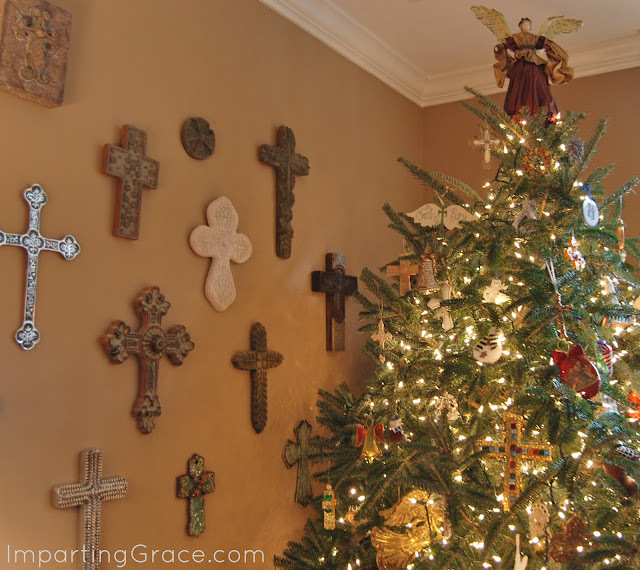 Your cross wall is stunning, and I love that Santa stocking in the middle of your fp, as well as the turq. 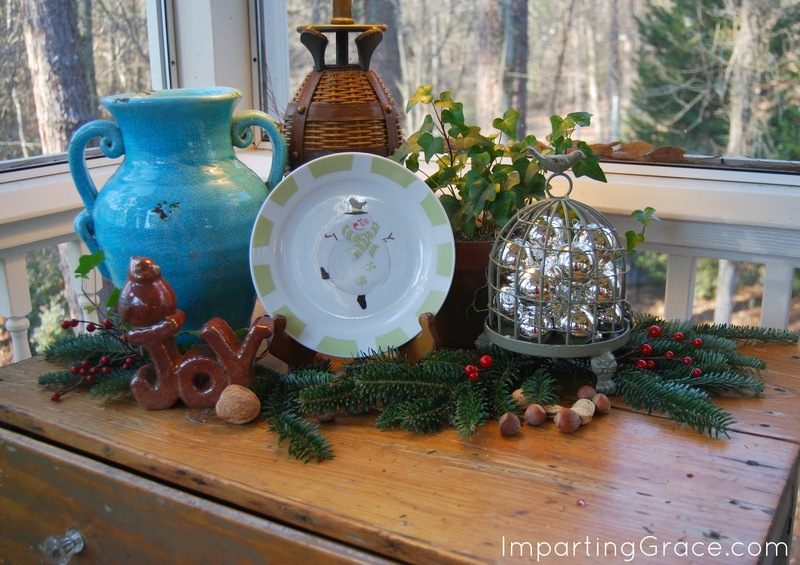 pottery on the screened in porch. I hope your son is doing well after surgery and that you and your family will have a great Christmas! 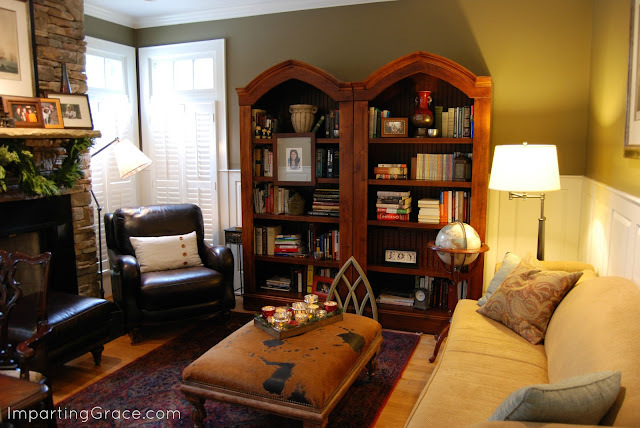 Candice, the color on our living room walls is "Craftsman Brown" by Sherwin Williams. This room gets a great deal of warm natural light because the six French windows and transoms face South, so it looks like cafe au lait. i've used the color in other locations without many windows and it looks more like hot cocoa. I like it both ways. Hope this helps! Your home is stunning! I so enjoyed your feature at SH! 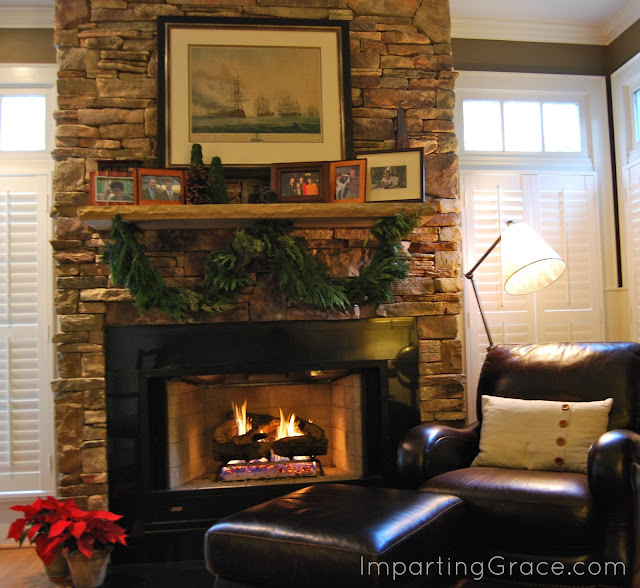 I am happy to have found another favorite blog! Thanks for the tour of your home - it's lovely! Happy Holidays! 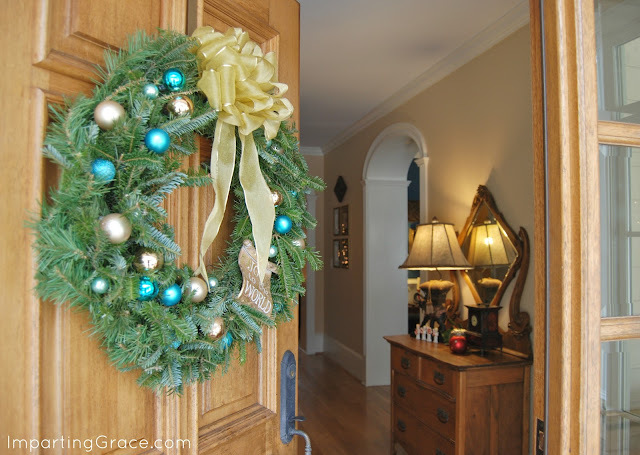 I know Christmas is well over but just wanted to comment on how beautiful your house looks, so homely and inviting. Also love the fact you have an extra Christmas tree on your porch.